Residents of one of the towns worst hit during last month's flooding crisis have staged a march against any plans to build on flood plains. Thousands of people walked through Tewkesbury in the rain on Saturday to urge the government to review its policy on such development. Organisers wanted to highlight the devastation caused by flooding. The government has not ruled out using flood plains under plans to build three million new homes by 2020. The march began at 1400 BST and a moment's silence was held for those who lost their lives in the floods. Tewkesbury resident Mary Daff, 59, told BBC News that her house had flooded and she was not expecting to be back in until December. "There has been a good turnout for the march and the mood is cheerful," she added. 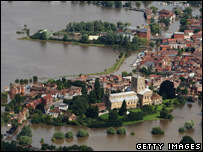 Hundreds of homes and businesses were damaged in Tewkesbury after the Rivers Severn and Avon burst their banks in July. Chuck Pavey, who sits on the town council, said: "Any change has got to come from the top down. "Ministers who say we shouldn't rule out building on the flood plain should come and live here. "There were over a thousand homes flooded here - many of them brand new - and some of the businesses will never reopen." Town councillor Philip Workman added: "We have been through an absolutely awful time in Tewkesbury. "Many, many hundreds of people have been flooded out and it is a case of highlighting the fact that this is a very real problem for us." The government should think "out of the box" when considering building on flood plains, he said. "It is a difficult problem, but it does need the government to look at the issue again to review its policy on building on flood plains because it just seems to the average person a nonsensical thing to do," he added. In July, Housing Minister Yvette Cooper told MPs no new building should take place in areas with severe flood risks, although the government's Housing Green Paper is less definitive. It says it should be avoided "if better alternatives can be found in the same area". 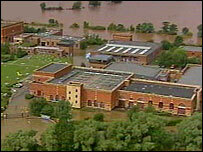 Ms Cooper had earlier said some new homes would be built on flood plains, subject to appropriate flood defences. A spokesman from the Communities and Local Government department added: "It is councils who decide whether to give planning permissions for new housing developments, but we have introduced the strongest planning rules ever to ensure they properly manage the risk of flooding. "The new planning rules require councils to consult with the Environment Agency before allowing new building in flood risk areas."